We popped out for lunch just before we were to send Lucy off on a residential school trip to the Lake District. 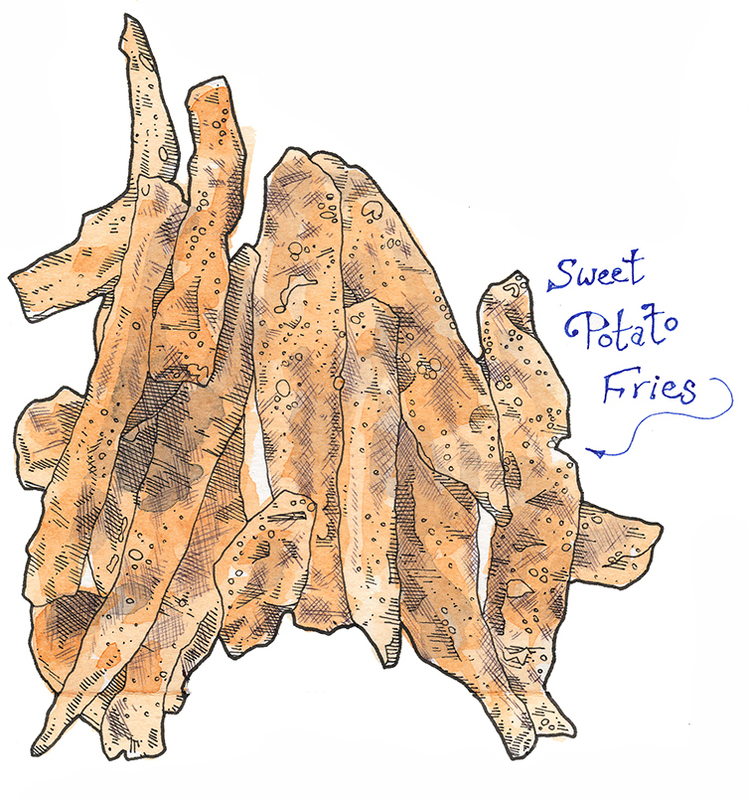 There seems to be a real trend towards Sweet Potato Fries at the moment. They’re everywhere. I guess it’s a sweeting-tasting alternative to the blander, regular fries. They’re quite moorish already, but I wonder what they would be like with a sprinkling of paprika on them? I had to go for my favourite Build-Your-Own-Burger option from the menu. It’s been a while since I’ve used biro in my drawing as well as my regular uni-pin. It’s really useful for getting in the finer shades of grey into a sketch, but most definitely not to be used for anything work that’s going to be displayed in light; as the biro fades over time. So, Lucy and I ordered our meals – I opted for this burger combination form the Build-Your-Own-Burger menu, while Lucy opted for a chicken burger. As we waited we challenged each other to come up with meal combinations from the menu for different characters. Trying to find food that had a connection with a real or fictional character. What would Cinderella order of she came here? Pumpkin soup starter and Meatballs (meat-balls!) and Spaghetti for her main course. I’m not sure that this is what Caroline had in mind when she told me that I had to sort out Lucy’s tea for her. It is sometimes a little too convenient having a gastro-pub just across the road. We had fun building our own burgers. It’s great being able to have a little control of putting it together. A gastronomic construction kit. I’d like to see a bit choice in there to be honest. Hey, we’re in Yorkshire, so why not, say black pudding (A baked blood sausage). Why isn’t there a more fish-orientated patty? Or some more eastern-orientated sauces, such as teriyaki or hoisin. I’d love to be able to build my own Mexican themed burger, or Indian curry themed burger. I vote for more options on the “Build Your Own …” menu – so they can go off into very esoteric, and idiosyncratic, directions. All Lucy came up with were pretty similar burgers to ones we’d had in other places. While it was fun having a bit of control, it would have been even cooler to have been able to create something with a more unique feel. It’s lovely living just opposite a pub. Well, I say ‘pub’, but really I should say gastro-pub, which is what a lot of traditional old pubs have been adapted into to survive. Long gone are the days of pubs being crammed with burly working men after a hard days work. Nowadays one is more likely to see suits and ties, than flat caps and cigarettes. Many of the pubs in central Brighouse, near where I live, have either recently closed or been transformed into something more than just a pub. A few years ago I draw about fifteen of the pubs in central Brighouse; it would interesting to revisit and see how many still resemble the slightly run-down interiors which they had back then. I can think of at least two which have been transformed into either restaurants or gastro-pubs and at least two which have closed totally. The surviving numbers have had refits and change-overs in staff to try to tempt more people in. Mind you, the pub across the road was built as a gastro-pub. It’s got a pretty good vibe going on; the menu changes every so often and the staff are always bright and friendly. Now and again I even pop in for a drink on my own; something I would even have considered doing before I started drawing again. It also makes for a very convenient stop-off for Lucy and I when Caroline’s working away and we want a quick and easy bite to eat. Today was a bit snowy and we voted as a family to trudge across the road for the cosy fire and meeting up with friends who live round the corner. I haven’t really written anything of cookery books here before, so please bear with me. I am attracted to the idea of the burger. Not the franchised rubbish at the fast food outlets. I mean, that I like the idea they could be so much more than people generally take them credit for currently. A burger is essentially a warm sandwich, and look where the humble sandwich has travelled and it’s many different forms and guises. 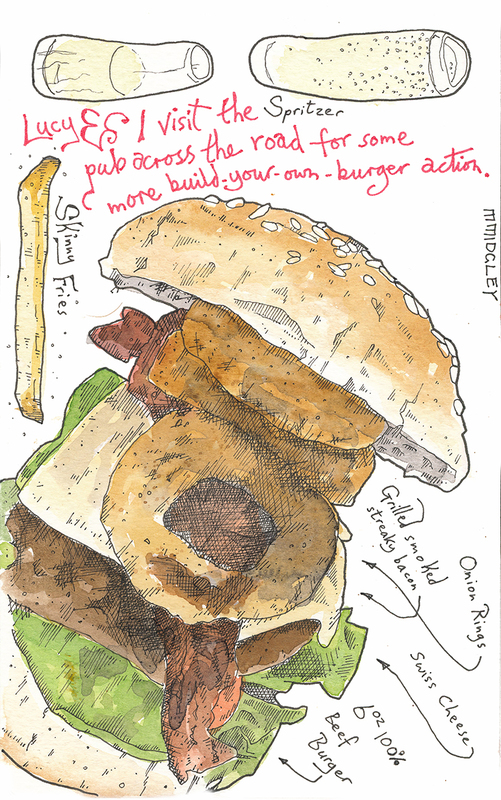 This book isn’t simple a re-hashing of The Burger as ‘The Great American Fast Food’. 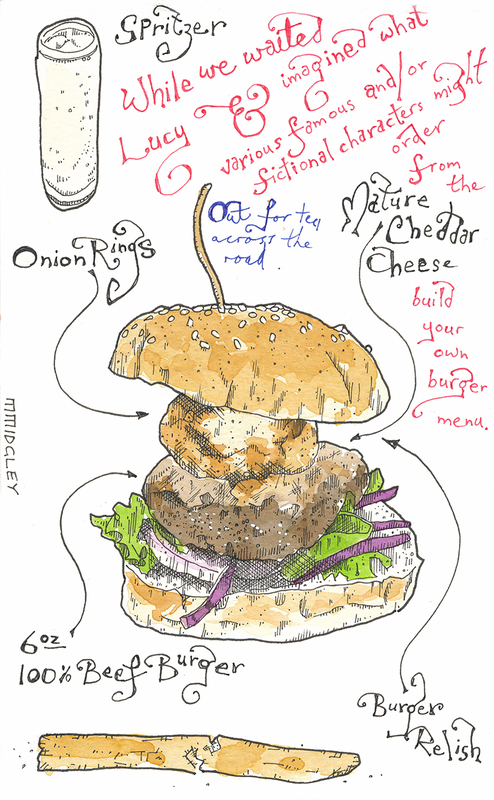 Instead it is reinventing the burger form into something more global. Not surprising that it is an internationally, rather than American, based restaurant, Blend (in Paris), which has developed recipes which somehow seem more international and, yes, gourmet. This isn’t to say that ingredients have been gourmet-ed up. On the contrary, the ingredients are all accessible and down to Earth. It’s their execution that raises the bar of this particular recipe book. The majority of the burger patty recipes are 100% meat and nothing else (excepting salt), which is a novel change, and go from the usual beef and pork to lamb, veal, salmon and cod (and the rest). As I’ve said, sauces are simple and easily made. (The only spice I’d not heard of was ‘Ras el-hanout’, which sounds Middle-Eastern and can be very easily mixed; cumin, coriander, cinnamon, ginger, black peppercorns, turmeric and saffron.